Yo, Adrian. They Did It. 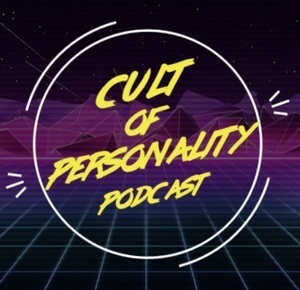 Cult of Personality is an Irish-made podcast series following the entire career of an actor or director each season. To listen to all episodes from Season 1, just click for Web, Spotify, iTunes or YouTube…. Posted in Misc and tagged Cult of Personality, Podcast, Sylvester Stallone at 3:52 pm on January 15, 2019 by Bodger. 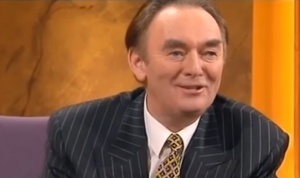 January 15 marks the 20th anniversary of Pádraig Flynn’s memorable appearance on the Late Late Show. During a routine interview with Gay Byrne, Pádraig Flynn, then EU Commissioner, was portraying himself as a perfect politician. When pushed to speak about Tom Gilmartin, a property developer who was reluctant to speak at the Mahon Tribunal, Flynn snapped. He launched into a rant about Gilmartin and his wife, who suffered from multiple sclerosis and was paralysed in a wheelchair. Gilmartin who was listening to the interview at home in the UK vowed to bury Flynn. It was an interview which would change the shape of Irish politics forever and cause the demise of Pádraig Flynn. Jack Murray, CEO and founder of MediaHQ.com, wrote and recorded a podcast (above) vividly recounting the story of the interview. The podcast really gets into the detail of the story and gives us some background that many people wouldn’t be aware of…. 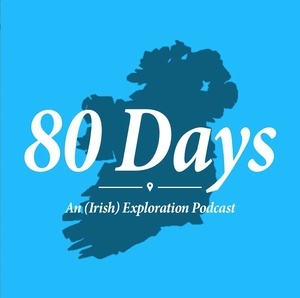 Posted in Misc and tagged Late Late Show, Padraig Flynn, Podcast at 10:02 am on January 10, 2019 by Bodger. A weekly podcast of weird world news. We’re a comedy news podcast. Each week we take a delve into some of the more interesting and weird headlines from around the web. And we take a look at news that was lost around the time of massive events in history – this week we focus on the news that was lost around the assassination of JFK. Get us anywhere you get your podcasts! It’d be great to get some feedback on our new format, 131 episodes in we’ve been doing it for close to three years – some outside perspective on a fresh turn would be great. Posted in Misc and tagged Podcast, The Pod Skwod, The Pod Sqwod at 10:33 am on July 26, 2018 by Bodger. Posted in Comics and tagged Podcast, story at 9:02 am on March 27, 2018 by Niall Murphy. 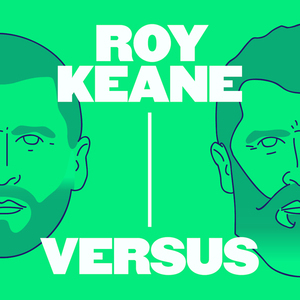 Posted in Misc and tagged Podcast, Roy Keane at 10:25 am on February 1, 2018 by Aaron McAllorum. The second episode of Meet Your Maker, the podcast about the people who make things YOU love. 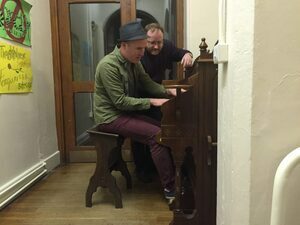 This week on Meet Your Maker, we go on a road trip with An Klondike music composer Steve Lynch (top left) in search of a harmonium and end up finding a priest in Cavan, Fr. Darragh Connolly (top right) who is a self confessed harmonium restoration “geek”. Posted in Misc and tagged Meet Your Maker, Podcast at 11:41 am on August 15, 2017 by Broadsheet. An inventive new podcast from face-painted broadcaster Liam Geraghty (top). Its been a long time coming but I’m thrilled to finally announce Meet Your Maker – a new podcast about the people who make the things we love, hosted by myself. The first episode launches on July 31. Subscribe now on iTunes / Apple Podcasts and Stitcher or wherever you get your podcasts. Posted in Misc and tagged Liam Geraghty, Meet Your Maker, Podcast at 3:27 pm on July 4, 2017 by Broadsheet. 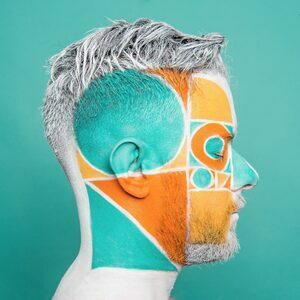 Irish multimedia producer and podcast specialist Donal Scannell has kicked off a new arts & culture podcast. His first guest? None other than songwriter and producer Moby. Among the topics discussed were diet, existential angst, fame and the current state of world affairs. I mean, I’ve never written a memoir before and I had worked under the assumption that memories were written by old politicians, or disgraced public figures or pop stars. 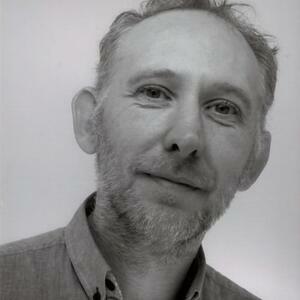 But then, I guess, it honestly all started with Patti Smith’s “Just Kids”, for me at least. That was when I realized that you could write a sort of discrete – when I say discrete I mean dealing with a specific period of time – memoi before you turn 90. I mean, Bob Dylan’s “Chronicles” were similar, it was partially about Bob Dylan, but very much about what it was like to be in New York during the nascent folk scene there and I thought, presumptuously perhaps, that I had had enough interesting things happen to me, and also I thought that enough interesting things have happened in New York during the period that’s covered by the memoire that it warranted being written. You know, if I was Chris Martin from Coldplay, and I like Chris, I’m not saying this to malign him, but there’s not much to write about, you know, he had nice parents, I’ve met his parents, they’re lovely, and his first record became successful and his entire adult life has been spent being successful. So if you’ve had a relatively stable, prosaic life, it’s probably not going to make for the best memoire, but my life has been neither stable nor prosaic so I sort of thought why not try and write about it? And then the question I had to ask myself was: Ok, how do I write a memoire and not waste people’s time? I didn’t want to just craft, I didn’t want this to be a PR exercise, I didn’t want to try and portray myself in some sort of flattering light that might help my Q rating, you know, I didn’t want to write a self-penned hagiography, I wanted to write something honest because that’s, I mean, it should be self-evident, but I don’t know if it is to say that the goal of art should either be abject entertainment or honesty, you know, because we’re, maybe I’m rambling on, but there’s sort of existential sort of underpinnings of everything that we do is trying to make sense of how baffling it is to be alive as a human being especially in a universe that’s 15 or 16 billion years old, you know, so we’re alive for a couple of decades, we pretend that we’re immortal, we pretend that our lives have meaning and significance, but deep down we know that we die, we disappear and we have no idea what, if any, meaning or significance our lives have had. So, for me, the response to that is just solidarity and communication, you know, and so that’s one of the reasons why I aspired to write an honest memoir because I wanted to talk about my experience being human, I didn’t want to lie about any aspect of it because there enough disingenuous culture in our world, like, I don’t feel the need to add more disingenuity to our sort of cultural pantheon. Listen to the podcast (grab a tay first, though) here. 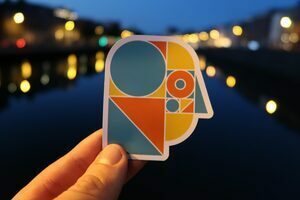 Posted in Music and tagged born optimistic, moby, Podcast at 10:14 am on February 21, 2017 by Broadsheet. 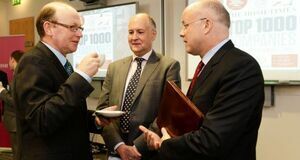 Culture editor of The Irish Times Hugh Linehan interviewed the newspaper’s Opinion Editor John McManus (above centre, with editor of The Irish Times Kevin O’Sullivan, left, and KPMG managing partner Shaun Murphy at the launch of a magazine in 2013) for his Inside Story podcast. It following Wednesday’s publication of Nicholas Pell’s ‘glossary of terms’ article and the reaction to the same. 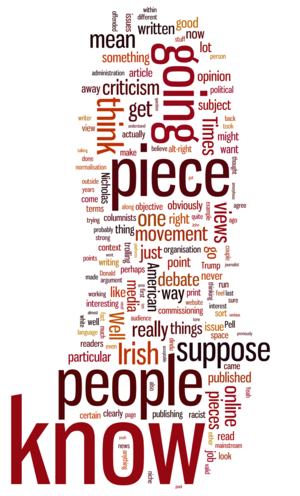 A ‘wordle’ of the interview. Posted in Misc and tagged Hugh Linehan, John McManus, Nicholas Pell, Podcast at 9:43 am on January 6, 2017 by Broadsheet.